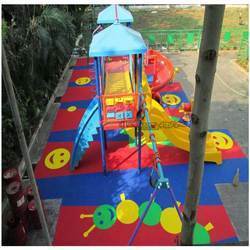 Prominent & Leading Service Provider from Chennai, we offer kids play area flooring. Berry Floors offers a wide range saftey flooring for kids play area. Base layer are made with Tyre recycled crumb which is blended with two synthetic rubber. This base layer is for cushion purpose only. Top layer is pure EPDM granules which is made with "Ethylene propylene diene monomer" with color pigment. Granule standard size in 1-4 mm. Top layer of EPDM is fix of 6 mm thickness in any system. EPDM granule have high weather and heat resistance properties...mainly non-toxic product.